It begins in the middle of the night when our bakers mix the doughs from scratch, and doesn’t end until the early hours of the following day when those loaves emerge from the oven – hot and fresh. Our bakers take great pride in producing world-class bread for you to enjoy every day. The hallmark of all bakers – we take great pride in ours classic baguette. Best served fresh. If you have day old baguettes, we suggest making crostini: Slice, toss with olive oil and salt and toast. This is a delicious bread to serve with roasted meats, poultry or vegetables. Baked on Fridays. Ingredients: Unbleached Wheat Flour, Water, Spinach, Olive Oil, Salt, Yeast, Garlic, Nutmeg, and Egg Wash.
We use the same dough as our baguette to make this big round loaf. It keeps longer and is the quintessential “every day” bread – it can be eaten with absolutely anything. Baked everyday. 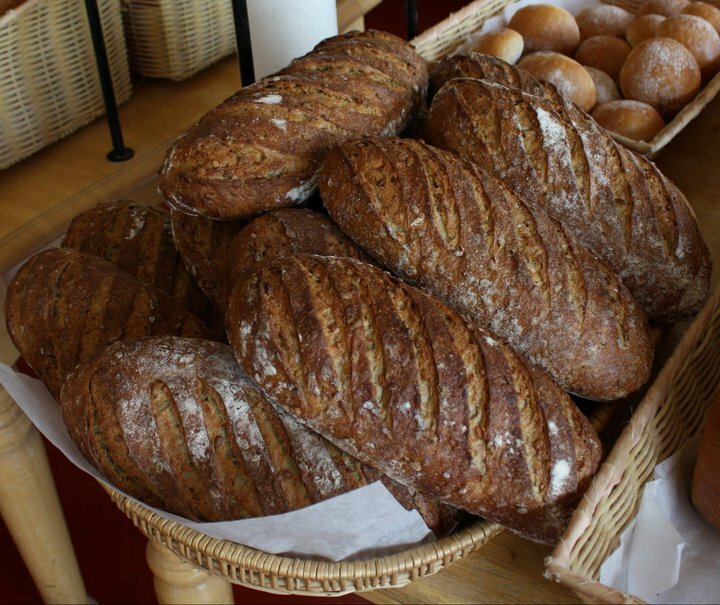 We use a special flour from Great River Organic Milling to make this bread – it’s got great wheat flavor and has an incredibly moist crumb. Eat with a soft, rich cheese like Havarti or Ridder, and don’t worry about it going stale – it keeps for up to a week! Baked on Thursdays, Fridays and Saturdays. This is a true olive loaf – rich with olive oil and packed with juicy Sicilian olives, it’s very good served with a simple pasta dinner or with an antipasti platter. Baked on Thursdays and Saturdays. We add lots of rosemary and kalamata olives to our Germ Levain dough to make this loaf – it’s a perfect addition to any cheese platter and a superb choice for a grilled mozzarella sandwich. Baked on Thursdays, Fridays and Saturdays. One of our most popular breads, this crusty loaf has a pleasingly complex flavor from the small amount of rye and whole wheat flour. Slice thin, brush with olive oil and toast to serve with cheese; or slice thick and serve to sop up stews and braised meats. Baked everyday. This is a very mild rye bread with classic caraway flavor – if you like pastrami or corned beef, you’ll definitely want this bread. Baked on Thursdays. Our version of ciabatta (stirato means “stretched” in Italian, referring to the way we transfer them to the oven), this bread is chewy and goes with everything. Our favorite way to eat it is to slice thick pieces, brush with olive oil and grill – chewy and crunchy and a perfect match for grilled chicken. Baked everyday. This beautiful loaf is pictured in the bottom right of this page. A well-balanced rye bread chock full of toasted sunflower seeds, this has rapidly become one of our most popular loaves. It’s great with a well-aged white cheddar, and kids like it too! Baked everyday except Mondays. A rich, buttery pan loaf – makes great grilled sandwiches and amazing french toast. Baked on Saturdays. This is a sweet Scandinavian specialty – so of course it goes great with coffee. This lovely loaf makes a nice gift, and is always appreciated at brunch. Baked on Weekends. The classic loaf from the Jewish tradition, most often served on Fridays. Ours comes plain, or topped with sesame or poppy – and it makes unparalleled stuffed French toast. Baked on Fridays. This Italian bread is studded with chocolate chips and is just sweet enough to enjoy at any time of day. Our customers like to eat this with mascarpone and raspberry jam, and many give this bread as a gift. Baked on Fridays, Saturdays and Sundays. It’s hugely popular and one of Harvey’s favorites. It goes with just about anything, savory or sweet. For St. Patrick’s Day we offer a version with caraway and currants. Baked everyday except Monday. True to form, this loaf is packed with nine grains and sprouted wheat berries. It’s nutty-tasting and moist, not dry and saw-dusty like some other versions out there. It makes a great sandwich – one of our favorites is hummus and turkey with sliced tomatoes. Baked Sundays, Tuesdays and Thursdays. A light, golden loaf covered in toasted sesame seeds. We make chicken sandwiches on this bread, and it just might be the best toasting loaf in the city. Baked on Mondays, Wednesdays and the weekends. This is your basic white bread, but with integrity. It is absolutely essential for BLTs or plain grilled cheese sandwiches – the surface crisps beautifully and the inside stays soft. (Call to special order a loaf without egg wash if you have egg allergies.) Baked on Sundays, Tuesdays and Thursdays. This has some honey and butter to smooth the rough edges, and is a definite cure for the “dry wheat bread syndrome”. It’s a must-have for tuna-on-toast. Baked on Mondays and Wednesdays. French for “string,” this is our demi-baguette. A great choice for picnics and bread baskets. Baked everyday. We make these everyday with our baguette dough – make a perfect sandwich with salted butter and sweet ham. Baked everyday. The classic Minnesota roll, served at thousands of turkey dinners and coveted for leftovers. The rest of the year, this is our go-to bread for hamburgers and pulled-pork sandwiches. Baked everyday except Mondays and Saturdays. Ciabatta sandwiches are the current craze – and for good reason. Chewy and significant, these hold up to your sauciest and salami-est creations with ease. Baked everyday. Available only during the holidays, this is the roll the bakers steal off the racks more than any other. They pack a bit of heat and provide a decidedly un-Minnesotan counterpoint to your traditions.